Feed multiple hummingbirds at once with 4 ports. . . . . 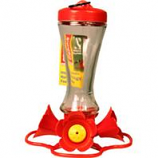 Plastic hummingbird feeder. 4 nectar ports and wide mouth. Easy to clean and fill. . .
Large opening for easy filling and cleaning. Continuous perch. Roof overhang protects birds and seed from weather. 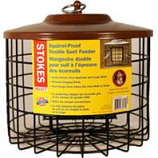 . .
Deters gray squirrels and large birds from reaching suet cakes.. The two-sided design attracts clinging birds such as woodpeckers nuthatches and other suet-eating birds. 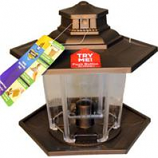 Durable metal construction has a weather-resistant finish.. . . 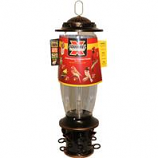 Antique style feeder with stunning 8-sided glass bottle. 5 integrated metal flower ports. Wide mouth design and beautiful glass bottle for easy fill and easy clean. Base disassembles for cleaning to reduce or eliminate spillage. .
Classic style feeder with unique metal ant moat and base. 5 integrated metal flower ports. Wide mouth design and beautiful glass bottle for easy fill and easy clean. Base disassembles for cleaning to reduce or eliminate spillage. .
• Squirrels Can T Get The Seed- Feed Birds, Not Squirrels! Capacity: 22 oz nectar. 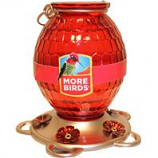 Red vintage glass design with hexagonal design pattern. 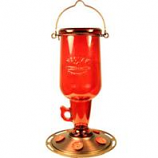 Has a rose gold metal base with 5 feeding ports. Mouth bottle is easy to fill and clean. .
Incredibly unique vintage bottle shape. Imprinted logo on 2 sides adding to the vintage look. 5 integrated metal flower ports. Wide mouth design and beautiful glass bottle for easy fill and easy clean. Base disassembles for cleaning to reduce or eliminate spillage. Roof twists off for easy filling and cleaning. 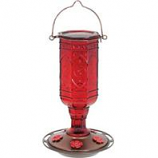 Attracts both clinging and perching birds. . . .
Feeder holds any seed mix. Attracts a wide variety of birds. 2 feeding ports. Easy-to-open lid for convenient filling. 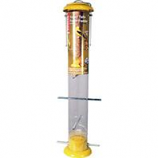 Easy to clean and offers clear view of seed level..
Locking roof lifts off for easy cleaning and filling. Design attracts both clinging and perching birds. . . .
Use to feed dried mealworms fruit seed nuts or suet nuggets. Roof protects food from the weather. Built-on catch tray. . . 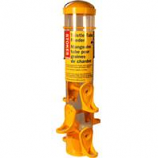 Wide mouth bottle for easy filling and cleaning. Detachable feeder base. 4 perches. . .
6 feeding ports. Attracts a wide variety of birds. . . .
One touch opening. Easily fill hanging feeders. No spilling or mess. One-handed filling. .
One touch opening. 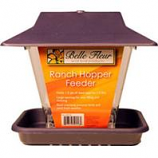 Easily fill hanging feeders. One-handed filling. No spilling or mess. . 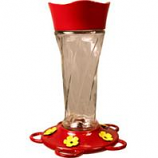 The stylish little-bit feeders series makes for a great gift to someone starting to feed birds. 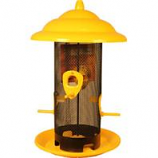 Will hold any finch mix and is a cute feeder to attract finches to your yard.. Beautiful yellow powder-coated finish is durable and will look great in your backyard.. 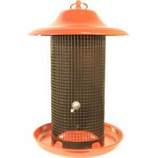 Specially designed seed diverter ensures that seed will moveto feeding areas keeping your seed dry and the finches happy. The unique twist-off top and base makes the little-bit feeders easy to fill and clean..
Squirrel's weight closes all ports. 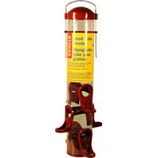 Durable metal construction deters squirrels. Feed multiple birds at once 6 port. . . 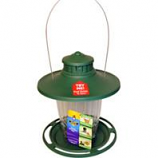 Specially designed to attract goldfinches and other finches. 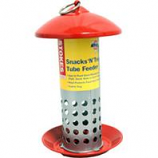 Durable polycarbonate tube that protects and contains seed allows you to see when feeder needs to be refilled.. Roof slides up to refill and clean. 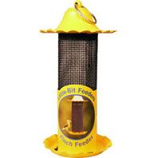 . .
Six feeder ports designed for smaller beaks like finches. Durable long-lasting metal construction. 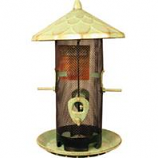 Attracts goldfinches house and purple finches pine siskins & more!. . .